Military Police Rings perfectly made to record the history of any individual that elects to wear this ring. 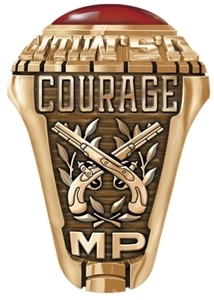 The Military Police Corps ring is a classic example of fine craftsmanship. With the cross pistols adorning the side of the ring. Just above the side image of the cross pistols a space available for some text. This text can be customized to display your name or indeed a special date. On the opposite side further text can be included to complete the side customization. Military Police are a very essential part of every branch of the Armed Forces. This group of men and women work tirelessly to keep law and order on base and in housing areas. They are extremely well trained and while the majority of them are friendly. Can be very stern in the execution of their duty. The Military Police are very easily identified by the patch that is worn on their uniform. The letters “MP” can be seen on the patch which is attached to the uniform by velcro. It’s recorded that the Military Police can trace its origins way back to 1776. They dealt with issues of discipline during the American Revolution. Before the Military Police the marshals depended on other soldiers in units to enforce discipline among the enlisted men. This duty mostly fell on the shoulders of higher ranked personnel such as Sergeants and lieutenants. It’s one of the busiest departments of the army as they often have to deal with tragedies like natural disasters at home and abroad. Today Military Police are responsible for looking after foreign nationals seeking asylum. This became very apparent during the conflicts in Iraq and Afghanistan where detention centers were setup to cater for this need. Custom made rings for all units and divisions ! Military Police Rings can be fully customized to show the Operation Iraqi Freedom and the Operation Enduring Freedom symbols on either side of the ring. The military rings are considered a fine example of unit pride.